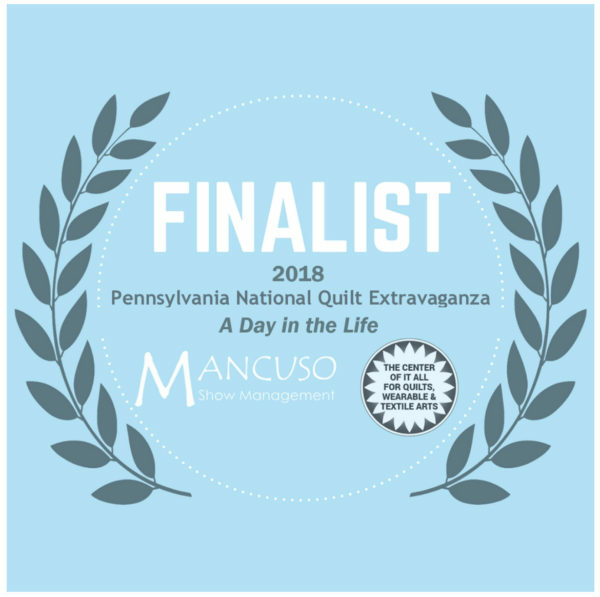 Art Quilting doesn't have to be complicated! I did end up solving all the problems and I’m pretty pleased with how it turned out but what a process! Here it is, “Green is My Garden“. I wrote a blog post about the art process over on rachelderstinedesigns.com which you can read here. Sometimes, though, you can keep yourself much more sane if you keep it simple. You just might end up with a very lovely and striking work of art. Here is the other quilt I just finished yesterday. It didn’t take long at all but it packs a punch because of the limited color palette, the strong contrast of those two (almost three) colors and the simplicity of the design. 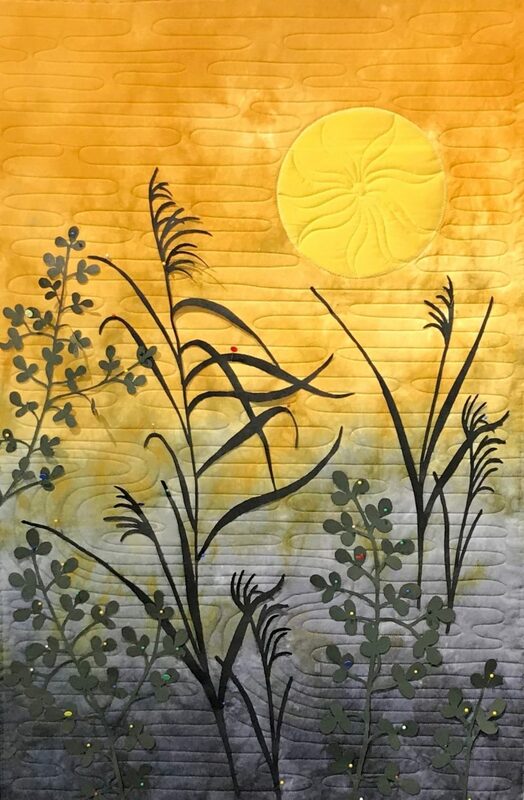 Speaking of colors, I used this Sunshine and Shadows gradient from Vicki Welsh for my background and I noticed that the areas where the gold and gray blended there were beautiful spots of olive green. I found a a tutorial about mixing black and yellow to come up with olive green on YouTube. Watch it here. It’s quite fascinating. The artist making the video claims that Mars Black contains some blue underneath it. Well, Mars black is an acrylic paint color and I wanted to use fabric paint to make my foliage. I decided to mix yellow, a little black and a small amount of blue to come up with my olive. It took a little doing but it worked. You can see the very dark olive in the foliage here. It’s almost black but not quite. This foliage is created by painting Evolon, a non-woven fiber and cutting it out on my Cricut machine. I sketched drawings of the foliage, intensified them with marker and then converted to them to black and white images in Photoshop. I bumped up the threshold, as well. These images were uploaded into my Cricut software and my Cricut Machine cut out the Evolon which had been coated on the back with MistyFuse. 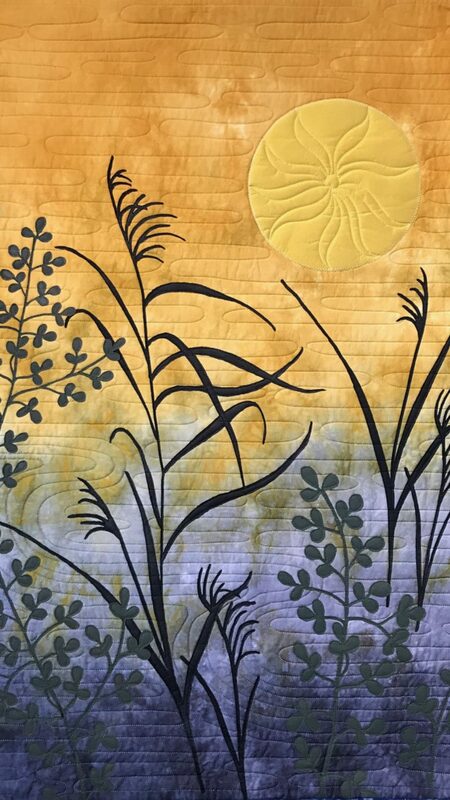 I decided to quilt this whole cloth background with only the sun appliqued on it before fusing all the foliage to the surface. Remember, “keep it simple”? It’s a whole lot easier to quilt something without having all that foliage in the way. I chose to use an Asian water design for the quilting and am very pleased with how it turned out. 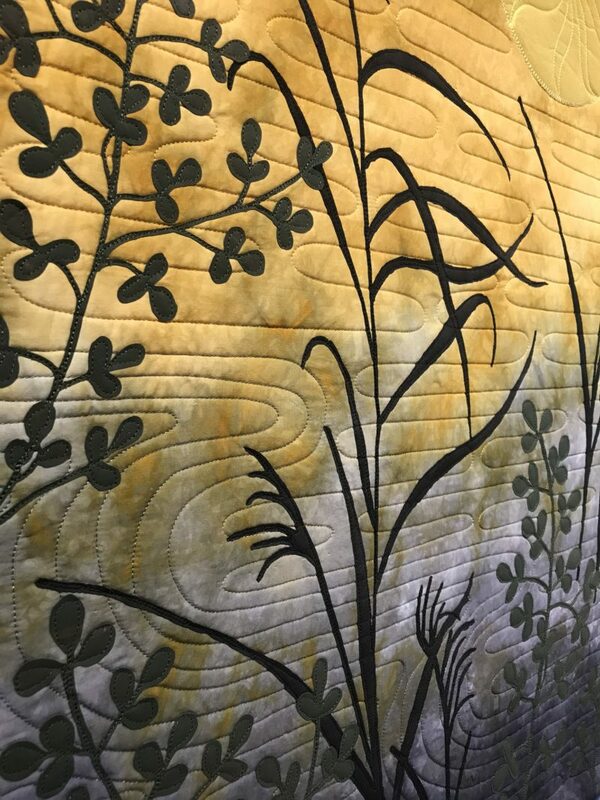 After the quilting was done I pinned all the foliage to the surface making changes to placement until I had the result I wanted. See the gazillion pins?? I then took my iron and fused all that foliage while it was still on the design wall, taking pins out as I went along. That iron got pretty heavy by the end! Then I loaded the whole thing back onto my longarm and stitched all that foliage down. It was by far the hardest part of making this piece. But think about it: I didn’t have to worry about fraying edges or turning under edges. That’s the beauty of Evolon. Love that stuff. I don’t really know what the olive green foliage is. I posted the sketch on Facebook and put an inquiry out. People came up with Common Rue, Jade, Mistletoe, and Seeded Eucalyptus. I still don’t know what it is but I just came up with it from memory – looks pretty. I do teach how to use the Evolon and Cricut Machine for quilting in my Artful Quilting Course. If you are interested in being notified when we re-open the course for enrollment be sure to sign up here. We have a target date of Oct. 1 to open Artful Sewing and we’ll reopen Artful Quilting on the same date. Don’t miss out! 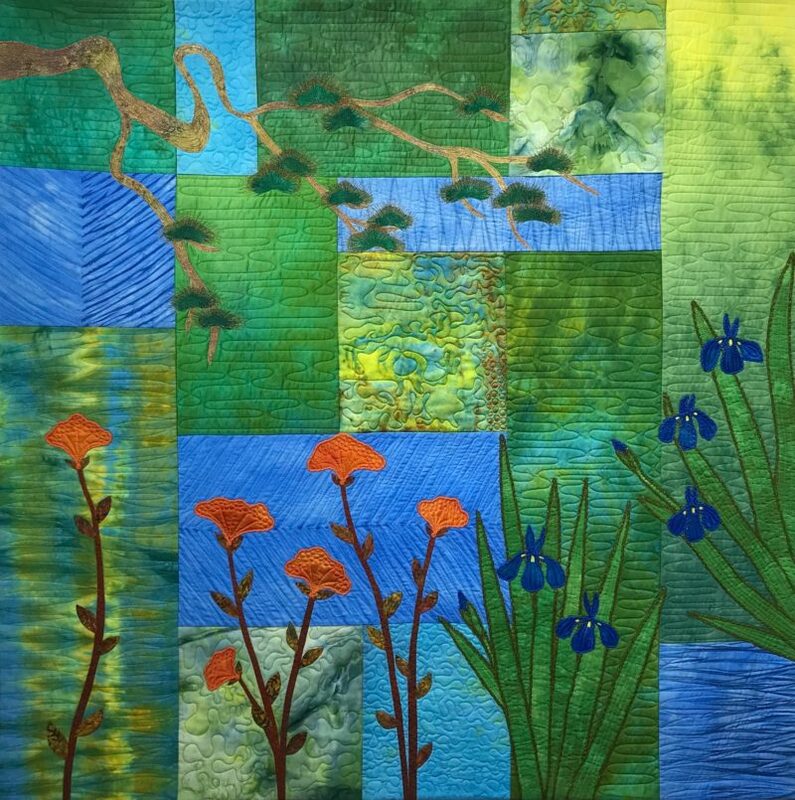 One more note, “Green is My Garden” will be on exhibit at the Pennsylvania National Quilt Extravaganza next week. It is a finalist in the competition. If you’re local and are planning to attend, give me a shout out. It would be great to meet up!